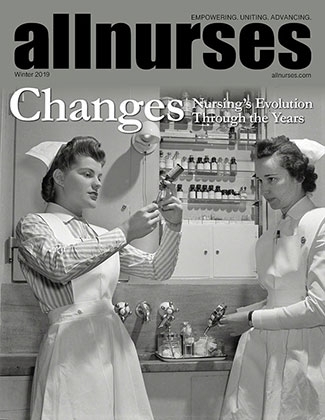 being a home health nurse if you have allergies and asthma? This is an old post, but I thought I would comment. I am a home health nurse of 1.5 years with asthma and a severe cat allergy. All of my employers have been aware of my allergy before I was hired. I have specified that I would prefer to avoid the cats, but in a pinch, I should be able to wear a mask. We all know that the state of the home environment is highly individualized; while this might be acceptable for a home that is pretty clean, if there is a hoarding situation or just generally unkempt, a mask may not be enough to avoid a trigger. In the few times I have been in a situation where a mask just wouldn't cut it, my employer would make exceptions and I would trade patients with someone. In my experience, almost every nurse has had a patient that they would prefer to not see, for one reason or another. Accommodations need to be made on a daily basis for reasons like this. I have found that home health is in such high demand, that there will plenty of patients for me to see that do not have cats. If you really want to do home health, don't get discouraged. Just be honest with the employer. If it is something they really don't want to deal with or can't accommodate you with, they won't hire you. I'm really glad that I didn't let my allergies keep me away from home health. For your info, I take Breo, Flonase, Singulair, Ventilin, and I carry an EpiPen. I was taking allergy injections for years, but I would never be able to tolerate the full-dose without having an anaphalactic reaction. I am a palliative care nurse in home health. It is a very rewarding job. Depending on where your market is, it can be a hard sell, as many people do not understand it. Palliative care is more about symptom management than curative measures. It can sometimes be a pathway to hospice, but not always. We also serve many people with COPD and CHF whom have frequent readmissions to the hospital. Our company uses Mckesson, and it is a royal nightmare. What software does your company use and how do you like it? I am curious to find out how people are managing working in home health under a salary, and prevent themselves from being abused. I have worked in home health just under 3 months and I am expected to do a full case load. I think if I was charting for 16 hours a day, they would let me. I work constantly and have no life outside of work. I have shared the same problem, except it is with all my clothes and I don't have to iron them to notice the smell. I started using unscented deodorant. Problem solved. No, it is not. I believe that there are plenty of people that would be willing to hire you on after being a palliative care nurse. As long as you are working in a hospital, you could always work there for a year or so and transfer to a different floor. You also may really like it. Either way, I think you will get a better idea of what you will want to eventually do as a nurse. I think the poster may have possibly been referring to RN-BSN programs? I'm not sure. I did my RN-BSN online, and we didn't really have any clinicals. Can I be a nurse with a colostomy? I don't really see how it would...or why you would even have to let anyone know that you have one. The only problem I could potentially see is that if you were working on a particular busy unit where patients were often confused and grabbing at things. I've seen patients practically pull a girl's hair out before and they have tried taking things out of my pockets. I think the solution to that would to wear some sort of a tight undershirt to bind it down a bit. It would also help with it not getting caught on anything. You can look at it like this...I often have to stop whatever I'm doing so I can run to the bathroom, and you at least won't have that to worry about, at least with making a BM. Good luck! Also, would you not be able to leave at all for days on end? I could see that as a problem, as well. It sounds like you would be giving up your ENTIRE life for a job, which is never worth it, to me. I think it would definitely be too much stress for me. And I'm also thinking about when you would be able to sleep. Are family members allowed to be with patients overnight? I could see a patient's family constantly calling you because they think their loved one needs more meds, etc. Some hospice patients will not call out for help, but some will. Some could even be confused and fall. I don't know...there are too many things that can go wrong. Whatever you do, if you want to work days don't ever agree to working nights. It is much easier to get placed in a job working days than to move from nights to days. Even if they say they will swing-shift you, say "I need strictly days". Just trust me on this one. If you give an inch, they will take a mile. I would say that your own personal heath trumps the sale of the company. You have to look out for yourself first. Although you may feel some guilt, it sounds like you have already weighed your options and have said that if they get an inkling that you are even looking for another job that they will drop you like a bad habit. Do you think that they would feel any amount of guilt for letting you go so soon? It sounds like this is at least a second career for you, and only you can determine what is best for your body. You gave it your best, but if something better comes along the way, there is no point in inhibiting yourself from a greater opportunity. We have a special name for those kinds of patients on our units. We refer to them as "Share the Love" patients. There is nothing wrong with getting burnt out from dealing with a patient...you can seriously only take so much.